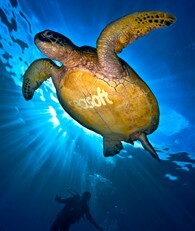 SEASOFT's SeaGLU-D™ is the DRYSUIT adhesive used by the world's best manufacturers. It has a super strong bond and sets up fast. Practice with scrap material before starting a major repair. We have been using this adhesive here at SEASOFT for more than 20 years and we know you will have the same success we do. SeaGLU-D™ is relatively easy to use and is a very quick to set up adhesive that works with all types of neoprene and shell suit fabrics. SeaGLU-D™ is a fantastic drysuit adhesive that comes packaged in a metal container with an integrated brush built into the handle. SeaGLU-D™ has a long shelf life due to the metal container that does not allow the glue solvents to migrate through the walls like they do in plastic containers. BUT you must keep the lid tightly closed, if not it WILL DRY OUT and this is not covered by warranty. Part #: 003-119 SeaGLU-D 2 oz. DRYSUIT Adhesive in metal can with integrated brush. 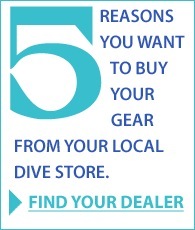 Why should you buy SEASOFT's "RANGER" Dive Gear Duffle Bag? You buy the "RANGER" because you love your dive gear to be organized. It is easy when you have a huge main cavity and two big end pockets and a really big front pocket and a nice mesh pocket for throw-ins like a water bottle. The "RANGER" has thought of everything with an interior pocket for de-fog, wax lubricants and other accessories. Never have a jumbled mess again. Organize it and carry it in comfort with the SEASOFT "RANGER" Dive Gear Duffle Bag. 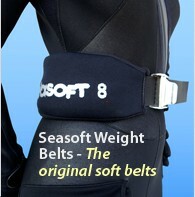 Why should you buy SEASOFT's DELUXE MASK CASE with included 2 oz. SEAVUE Anti-fog Spray? SEASOFT's Deluxe Mask Case is the most intuitive, easy to use, protective and convenient mask case a diver or snorkelor can buy. Its soft padded sides protect your mask from falling gear or if you drop it by accident and, of course, it protects the lenses from being scratched. The integrated anti-fog pocket comes loaded with a 2 oz. bottle of SEAVUE anti-fog spray. It's so convenient and keeps you from having to search needlessly for your anti-fog when you most need it. You will really appreciate the fact that the SEASOFT Deluxe Mask Case will hold your mask WITH the snorkel attached. That's right, you don't have to remove the snorkel to use the mask case, just pop it in and your mask is protected. The SEASOFT Deluxe Mask Case has the traditional dive flag and the new ALPHA blue and white dive flag on the left side, so you are prepared for international travel. So protect your mask, have your SEAVUE anti-fog within easy reach and to have both dive flags proudly displayed with a SEASOFT Deluxe Mask Case. The SEASOFT SEA-DIAL™ Mask Strap is a breakthrough in mask strap design. It ensures the perfect fit, perfect tension, perfect angle and the ease of use is phenomenal. The SEA-DIAL™ allows yu to tighten your mask strap in 1/4" increments the most comfortable dive you have ever had - never dive with a mask that is too tight again! The SEASOFT Mask Strap is designed to leave your current mask strap in place. Instead of replacing your mask strap you take your mask strap and place it into the open clam-shell between the 2 layers of 3 mm DINA-HIDE™ neoprene and then close it, giving you a nice comfortable, cushy fit. 1. This extra thick neoprene helps your SEASOFT Mask Strap float your mask if it is accidentally knocked off or dropped. 2. It also is great for keeping your hair from getting tangled in the rubber strap. 3. Another advantage is that with the SEASOFT Mask Strap's large neoprene strap, your mask is being pulled evenly from the top and bottom giving you a more comfortable, waterproof fit! 4. When wearing a hood, it is also easier to tell whether your mask is mounted correctly. Often with a split rubber strap, it is difficult to tell whether the straps are tangled or crossed at the back. The SEASOFT DELTA FORCE Super Mask™ is an extremely lightweight frameless single lens mask design that is coveted and used by the US military and other elite armed forces around the world. Like the best riflescopes, the lenses of the SEASOFT DELTA FORCE Super Masks™ are manufactured with ULTRA CLEAR HGG Glass™ and CRYSTAL ARC™ metal oxide coatings for unsurpassed optical clarity even in the most challenging visibility. • SEASOFT's LIFETIME BREAKAGE WARRANTY; if it breaks, it’s replaced, this includes GLASS BREAKAGE. Available in All BLACK and All CLEAR.